City Wakes 2 In London In 2010? Following on from the success of The City Wakes event in Cambridge in 2008, Escape Artists, who administer the Syd Barrett Fund, are looking at the possibilty of holding a similar event in London late 2010. The organisers say they are hoping to raise awareness of the Syd Barrett Centre for Social Arts and Research. At this stage the project is still on the drawing boards and funding is being sought. This was followed up later by an announcement on Arthur’s official site that says “Arthur is touring with Jim Mortimore on Guitar and Percussion straight from his stint recording Guitar parts for David Gilmour’s new album, and Steve Watts on Keyboards”. An AFG correspondent managed to grab a quick word with Jim and was told that he had been working with David Gilmour in his home studio and that he thinks the album could be out early next year. To firm up the story even more, there is a picture on Jim Mortimore’s Myspace that purports to have been taken in David’s home studio. UPDATE After a hurried exchange of emails with David’s Manager, David has confirmed that the picture is in fact a fake and Jim Mortimore is in no way involved with any new album of his. We are also informed that a new album from David is unlikely in the foreseeable future. Seasons Greetings From All At AFG We would like to take this opportunity of wishing all our site visitors a wonderful & safe festive season. This year, instead of having Nick Mason singing Happy Christmas to you (as has been tradition for some years now) we have a super extra treat. Dark Side Of The Moon Back In The Charts With the revamping of the Billboard 200 recently to again include both current and catalogue titles, at No 189 Pink Floyd’s Dark Side of the Moon re-enters the chart for the first time since Oct. 8, 1988, logging a record-extending 742nd week on the survey! The album, which debuted on the tally on March 17, 1973, leads the album with the second-longest stay on the chart by 252 weeks (or 4.8 years). Here’s a list, of the releases with the longest chart lives on the 53-year-old Billboard 200 (with debut years noted). Roger Waters At The New Yankee Stadium Roger Waters was at the new Yankee Stadium on Wednesday (4th Nov) as a guest of Hank Steinbrenner (part-owner of the New York Yankees) to help him celebrate the Yankees winning their 27th world championship and christening their new stadium in style. Hank in speaking to the media dropped this little pearl. “Tonight I had Roger Waters from Pink Floyd as a guest, I don’t know if you guys are Floyd fans. We’re trying to get something done with rock concerts as well as the football games. And he was blown away. He’s played all over the world. It’s spectacular. It really is.” Hmmmmmmm! Nick Doesn’t Rule Out Playing On The Possible Wall Tour Nick Mason was on BBC Radio on Saturday (14 Nov) and was specifically asked about Roger’s plans to tour The Wall next year. He said he has not been officially approached to play and ruled out playing the entire tour, but he did not rule out guest appearances. Celebrate The Wall With Redbeard For over 20 years ‘In the Studio’ has gone behind the scenes to tell the stories behind rock and roll’s greatest albums. North American radio host and program director, Redbeard, has recently dedicated two weeks of his program “In the Studio” to Pink Floyd’s “The Wall”, which is celebrating its 30th year anniversary this year. Redbeard has conducted exclusive interviews with Roger Waters, David Gilmour, and Nick Mason in this two part interview series that is airing throughout the U.S. radio circuit the weeks beginning Nov 16th for Pt.1 and the following Monday Nov. 23rd for Pt. 2. To locate your nearest station, or for those outside the radio listening area, go to www.IntheStudio.net beginning Monday the 23rd and Monday the 30th to stream each interview for free in its entirety. Roger Waters Mother Passes Our condolences go out to Roger and his family with the sad news of his Mother’s passing. Mary Duncan Waters passed away peacefully on 14 October at the age of 96. Point Me At The Sky – Dark Side Tribute On Primrose Hill. Sky Arts have created a pyramid on London’s Primrose Hill to publicise their showing of Pink Floyd’s Earl’s Court 1994 performance of The Dark Side of The Moon on Sky Arts 1 in HD. They have constructed a 5-metre high pyramid adding a large structure over the London skyline. They are using the imagery to promote the screening of Pulse: The Dark Side Of The Moon Live, which transmits on Sky Arts 1 on Friday 23rd October at 10am and 4pm. The main triangular part of the structure houses the large ‘prism’ which uses diffused LED lighting to create the glowing effect that appears on the album artwork. Lasers have been set up and installed behind the structure, with a white laser emitting from the left hand side and coloured beams emitting from the right hand side, re-creating the image that appears on the famous Pink Floyd album cover. The Division Bell Soon To Be A Royal Mail Stamp Pink Floyd Management have been in touch to tell us that Pink Floyd will receive the accolade of being featured on a UK Royal Mail postage stamp on 7th January 2010. After the success of Royal Mail’s recent British Design Classics stamps, they have created a series featuring only classic UK album cover designs. Available from Thursday 7th January 2010, it includes the 1994 UK Number One album The Division Bell, which went on to sell more than 10 million copies around the world. Designed by Storm Thorgerson with Keith Breeden, the cover depicts two massive heads, created by Sculptor John Robertson, placed in the East Anglian landscape, which in turn suggest a ‘third face’, echoing the album’s themes of contradictory communication. The self-adhesive stamps are printed in two separate sheets of 25* There is also a souvenir sheet (223 x 188 mm) including stamps with water-activated gum’. * (The sheet containing ‘The Division Bell’ also has album covers by Coldplay, Blur, New Order and The Rolling Stones). Doctor David We Presume! David Gilmour is among a host of Cambridge figures set to be awarded honorary degrees by Anglia Ruskin University. A total of 21 high achievers will be recognised in ceremonies in Cambridge and Chelmsford, the sites of Anglia Ruskin University’s two campuses. David is a former student at Cambridgeshire College of Arts and Technology (CCAT), a forerunner of ARU. He will be made an honorary doctor of arts at a ceremony at Cambridge Corn Exchange on November 11. The university said the award recognises his outstanding contribution to music as a writer, performer and innovator. David Gilmour In Recording Studio? Alex Paterson from electronic music group The Orb, in a statement to The List said ‘I’ve just started work on an album with David Gilmore from Pink Floyd which I think every Orb and Pink Floyd fan will want to hear.’ Our investigations continue! UPDATE: David’s official site has announced that David has done some recording with The Orb and producer Youth, inspired initially by the plight of Gary McKinnon. They say that nothing is finalised, and nothing has been confirmed with regards to any structure for the recordings or firm details regarding any release plans. Rick Wright Leaves £24 Million Details of the late Rick Wright’s will have been revealed to show that Rick left around £24 Million, the majority going to his children, James, 42, Gala, 39, and Ben, 17. None of Rick’s three former wives (Juliette, Franka and Millie) were mentioned in the will. Rick also made arrangements in the will for ‘a really good party’ to be held for his friends – putting aside £20,000 with a guest list to be drawn up by James and Gala. They were also left their father’s house in Le Rouret, in south east France. Gala also inherited Rick’s prized Aston Martin DB5, and he left his cherished Bosendorfer piano to his son-in-law bassist Guy Pratt. The moral rights to his musical, literary and performance work were left to his children. (Pictured, Rick with former wife Millie & son Ben in happier times). Thanks for the help to a few sources, including Phil Evans. Nick Mason At Abbey Road Nick Mason was at the world famous Abbey Road Studios on 7th September to record a charity version of The Beatles classic All You Need Is Love. Nick, who appeared along with Bill Wyman, Peter Gabriel, and Bryan Ferry, was there to assist the worthy BBC Children In Need Whilst at the studio Nick was interviewed about the announcement that Radio 2 breakfast show host Terry Wogan was giving up his show. We haven’t recorded Nick’s response to that but he did say that Pink Floyd has not ruled out working on a Rock Band or Guitar Hero-style game in the future. “I think we’d consider it,” he told the BBC. “I think everyone’s looking at new ways of selling the music because the business of selling records has almost disappeared. “I’m of the old guard who are really sad about that, because I always liked the concept of the album – rather than just cherry-picking tracks – and also the business of the art work that went with it.” He added that any new material from Pink Floyd was “very unlikely”. “We’re all still interested in the catalogue and trying to make the most of it, re-mastering when necessary, and looking at other things that we could do with it,” Mason added. “I think we’re all still very proud of it – we do talk to each other occasionally.” Here are some cracking pictures from the event for your enjoyment. The Wall To Be Performed In Czech Republic October 31st will see a full performance of The Wall in Prague’s biggest concert hall the O2 arena. To be performed by some of the countries finest musicians, this will be the full production, including the erection & ultimate destruction of the wall. This will be the 6th time The Wall has been presented by these musicians, with previous performances receiving high acclaim. You can get more detail from the Official Website (Pic from previous performance) UPDATE Harry Waters (Roger’s son, and part of his touring band) has confirmed he will be playing keyboards at this event. Can You Help? In 1971 Pink Floyd embarked on a ‘tour’ of Australia and played at Festival Hall in Melbourne on the 13th August (read our review) and at Randwick Racecourse in Sydney on the 15th. There has been some short footage of the Randwick show available for years (You can find it on YouTube) but apart from that, to date, no still photos have surfaced. It’s understood that at one stage a (music?) magazine was on sale on the Australian eBay site, which it’s said contained a review and one or more photos of the 1971 Melbourne show. This is where we need your help. If you are aware of what magazine the picture/s appeared in, or better still, if you have any photos of the 1971 Australian shows (Especially any with David Gilmour playing his Black Strat) we would be delighted to hear from you. We need these photos to assist an author with an upcoming book and if you can help and your photo/s are used, you will be given full credit. UPDATE: We have had a good response to this story (and tracked down the magazine mentioned) but sadly no pictures have yet turned up. We are still looking, so if you can help please CONTACT US FURTHER UPDATE Thanks to those that helped with this. A photo has turned up, so mission accomplished. Pink Floyd Venice Expo Almost Certain We reported back in April that an OFFICIAL Pink Floyd Expo was under consideration for Venice in 2010. We can now confirm that plans have progressed to a point where this event seems to be almost certain. It’s understood that there are still some council permissions to come and some red tape to be cut, but if all goes according to plan the exhibition should proceed, we understand in July 2010. At this time the venue has not been disclosed, nor has the length of time the exhibition will run for. You can be assured that we will keep you informed of developments as they occur. The exhibition presumably will be run along the same lines as the Interstellar Exhibition, that was held in (Paris Oct 2003 – Jan 2004). UPDATE (September 29th) We have had word from Pink Floyd’s Manager that there are still about 6 months to go before this is finally determined. Roger Waters ‘Walled Horizons’ On YouTube On Wednesday (19 Aug) the United Nations premiered a film narrated by Roger Waters on the plight of Palestinians living in the shadow of Israel’s controversial separation barrier. The 15-minute film entitled “Walled Horizons” was made in honour of the fifth anniversary of the International Court of Justice’s (ICJ) opinion that the barrier’s meandering route through the occupied West Bank is illegal. The film opens with a wide shot of Roger, walking along a towering concrete segment of the barrier beneath the painted silhouette of a giant lying on its back. Roger said “The reason for walls is always fear, whether the personal walls that we build around ourselves or walls like this that frightened governments build around themselves,” “They are always expressions of a deep-seated insecurity.” Roger’s Manager has been in touch to tell us that the film is now officially released on YouTube and you can view it in two parts directly below. New Interview With David & Nick North American radio host and program director, Redbeard, recently had the opportunity to talk with David Gilmour and Nick Mason about the 15th anniversary of ‘The Division Bell”. Redbeard’s syndicated radio program, ‘In the Studio”, airs on over 90 stations across the U.S. and is dedicated to telling the stories behind the greatest albums in Rock and Roll history. The shows, with exclusive interviews with Gilmour and Mason, are airing during the week of August 17th. To locate the radio station nearest you, or for fans outside the listening areas, tune in online at Redbeard’s website, which also features a Richard Wright tribute show with past interviews. David Gilmour & Chicago Promo Video David’s Management have been in touch to tell us that there is new promotional video clip of the Chicago single, featuring David with Chrissie Hynde & Sir Bob Geldof, which is now available from David’s Official Site Sadly the news is not all good, as alleged hacker Gary McKinnon has just lost his latest legal battle against extradition. You might also care to Download The Single where you can make an (optional) donation in aid of Autism charities. Then it was time for a hug or two! Guy Pratt Live Interview AFG in conjunction with Radio Station Valley FM 95.9 were proud to present a live interview with Guy Pratt on Thursday 23rd July. AFG correspondent Les Bounds chatted to Guy about his current Breakfast Of Idiots standup comedy tour, of his time with Pink Floyd and various other things! David Gilmour & Rod Stewart Back in the ’90’s Rod Stewart put aside some unreleased tracks, including a version of ‘In A Broken Dream’ (Which he had previously recorded with Python Lee Jackson in 1969). What’s remarkable about this track is that it features David Gilmour on guitar, John Paul Jones on organ and additional instrumentation Nick Lowe & Pete Thomas. In September, Rod will release a new box set, which will include ‘In A Broken Dream. David Gilmour ‘Chicago’ Download Sir Bob Geldof, David Gilmour and singer Chrissie Hynde have recorded a song in an appeal to Barack Obama to stop the extradition of Gary McKinnon. The song calls on the president to use his powers to stop the autistic computer hacker being forcibly removed to the U.S. for trial. They join dozens of others who have already given their support to the campaign against Gary’s extradition for hacking into Pentagon systems in search of evidence of ‘little green men’. The trio have recorded a version of the folk/rock classic, Chicago (We Can Change the World) by Graham Nash, after Gary’s mother Janis Sharp helped to make a few changes to the lyrics. She chose the song especially to appeal to President Obama, who is from Chicago. Mrs Sharp said: ‘We need to reach him and ask him to help Gary as I think that is what its going to take to change all this by standing up for Gary’s human rights and justice for autistic people. I thought music would be the best way to do that. ‘David Gilmour has been a family friend for a long time and he’s asked Sir Bob to get involved because he’s the sort of person you need to tap into governments and politicians.’ David had previously said ‘This is a heavy handed response from the U.S. and it’s hard to understand that the English justice system could not be more effectively used to prevent this. I hope that common sense will prevail.’ All three musicians sing on the track, which can be downloaded from www.freegarymckinnon.co.uk. Peter Curzon In Brisbane Highly acclaimed UK designer Peter Curzon will be in Brisbane (Australia) on Saturday 18 July. Peter will present a fascinating behind-the-scenes expose of the stories behind some of the greatest album covers in history, as he takes visitors around Storm Thorgerson’s stunning Taken By Storm exhibition. Peter, is a close colleague of Storm’s and they have co-authored the Mind Over Matter & The Eye Of The Storm books. He has also worked on over 30 album covers with Storm. There will be a question & answer segment, where you can try to get Peter to spill any little secrets he may have about Pink Floyd, or any of the countless other bands he has designed for. Peter will be at the Artisan Gallery 381 Brunswick Street, Fortitude Valley (07) 3215 0800 between 2.30pm-3.30pm on Saturday 18 July. Admittance is free. UPDATE Read our exclusive report of this event. Nick Mason At Goodwood Nick was once again at Goodwood (UK) last weekend (3-5 July) driving a 1939 Auto Union D-type (a genuine model with only five in existence). AFG correspondent Phil Evans was able to catch up with Nick during the event and managed to persued Nick to sign a copy of Author Mark Blake’s most excellent Pigs Might Fly book. Taken By Storm – Brisbane Australia As we exclusively revealed a while ago, Storm Thorgerson’s traveling art exhibition has now hit Brisbane – Australia and continues through until 1 August. The exhibition is at the Artisan Gallery 381 Brunswick Street, Fortitude Valley (07) 3215 0800 and is open Tues-Fri 10.30am – 5.30pm Sat 10.00am – 4pm. There are over 50 wonderful art works to droll over, all of them are limited edition fine prints, numbered and signed by Storm. All works are for sale. Snippets Here’s a couple of events that could be worth checking out if you are in the area. Harry Waters Band Performing Sunday 21st June at 8:30pm at The Bulls Head 373 Lonsdale Road Barnes London. Tear Down The Wall – Roger Waters Roger Waters has said that he would give a concert in a flash if Israel’s West Bank wall is torn down. Roger, who has been visiting Israel and Palestine, made the promise Tuesday (2 June) during a visit to a Palestinian refugee camp that is hemmed in by the separation barrier’s tall slabs of cement. Roger had harsh words for the West Bank barrier, which Israel says was built as a defense against Palestinian militants. Roger says the wall amounts to an oppressive grab of Palestinian land and that he hopes that ”this thing, this awful thing, is destroyed soon.” This isn’t the first time Roger has spoken out against the West Bank wall, on 21 June 2006 he visited Bethlehem and spray-painted the words ‘No Thought Control’ (pictured) on a section of the security fence. Whilst in Israel Roger visited a former movie theater in Jenin. (Cinema Jenin, was shut down in 1987 and is being reopened as a film school). He also visited the Sam Spiegel Film and Television School in Jerusalem, to show his support for the institution and to encourage cooperation between the Spiegel School and Cinema Jenin. David Gilmour Performs For Charity David Gilmour performed on 25th May at one of the ‘hidden’ Crisis gigs, where he collaborated with Mali superstar duo Amadou & Mariam The ‘hidden’ venue turned out to be the Union Chapel in Islington. Reports are that it was an enjoyable gig, with David’s spot being “very guitar jam heavy”. ‘No Way’ was played, (See video clip below) with David joining in on guitar, but no vocals from him. Nick Zooms Into London Nick Mason recently (7 May) drove his Ferrari 250 GTO in Regent Street London for the official opening of the new Ferrari Store. Pictured above (Click To Enlarge) are (left to right) Nick with Ferrari F1 driver Kimi Raikkonen. Nick’s Ferrari 250 GTO.Nick talking to some of those in attendance at the opening. Many thanks to UK correspondent Elliot Smith for the pictures. Beyond The Darkside Raise The Opera House Roof! In an incredible performance on Friday night (8 May) Beyond The Darkside put in the performance of their lives, that had the capacity crowd on their feet almost from the start. The opening set consisted of a collection of Floyd classics, with the second set featuring the Dark Side Suite with 6 songs from The Wall as the encore. Front man Kevin Hunt. although suffering from a virus, is sounding more like David Gilmour than ever, and his guitar work was phenomenal. We hear that several overseas promoters are fighting over the rights to tour the band in the Nth America & Europe, so keep an eye open for some announcements, possibly later this year. In the meantime Australian audiences get two more chances to catch this tour, as the band will be performing in Melbourne on May 22 & 23 at the Palms At Crown. We really urge all Australian Floyd fans to get out and support our home grown product while you still can! Pink Floyd To Sue EMI? The Guardian (UK newspaper) have reported that Pink Floyd are suing EMI and its private equity firm owners Terra Firma, claiming that the label has miscalculated their royalty payments. The legal action likely occurred during the band’s negotiations over payments that occur every three years. The exact terms of the lawsuit weren’t revealed, and both EMI and Pink Floyd declined to comment on the case. However, since only the Beatles have outsold Pink Floyd’s back catalog over the past 25 years, this case may be over multi millions in lost royalties as Dark Side of the Moon and The Wall are among the best-selling albums of all time. Les Porcs Pourraient Voler En Français! Relax, we haven’t gone continental on you! It’s just our way of telling our French visitors that Mark Blake’s splendid book ‘Pigs Might Fly – The Inside Story Of Pink Floyd’ has been published in French. The French edition is available through Amazon France and of course don’t forget you can still order the UK Edition or the US Edition (Where it’s known as Comfortably Numb) French translation thanks to Babel Fish, no correspondence entered into! Pink Floyd Expo In Venice? Regular Italian AFG correspondent Stefano Tarquini has been in touch to tell us about rumours circulating in an Italian newspaper (Il Gazzettino di Venezia) that state that there is to be an OFFICIAL Pink Floyd Expo to be held in Venice in July 2010. It’s said that the organisers are looking for a suitable building that will be large enough to house the Flying Bed & Pig, Mr Screen, The Wall Airplane, instruments, lasers and interactive material. It’s planned to have two dedicated exhibitions in honour of the late Syd Barrett & Richard Wright. Curiously the article concludes with this. “it is not excluded that there is a surprise next year, maybe a new LP. Gilmour will be in tour in 2010 and it’s not excluded that the next year we find something new by Pink Floyd”. (Translated). We asked David’s Manager about this and he has confirmed that they are looking at the possibility of an exhibition, although it’s only in the discussion stage at this time. He also stated that it was doubtful that there will be a new album and tour from David in 2010, and assured us that there would be nothing new from Pink Floyd. Storm Thunders Across The World Storm Thorgerson’s highly acclaimed and populare travelling art exhibition ‘Taken By Storm’ is set to stride the world stage once more. London’s Gallery@Oxo at Oxo Tower Wharf, Bargehouse Street, South Bank, London (where Storm’s ‘Mind Over Matter’ exhibition was held in 2008) will see Storm’s latest exhibition from 14 – 31 May. It then takes a giant leap across the pond, where it will open at the Artisan Gallery in Brunswick Street Fortitude Valley Brisbane (Our little bird was right again) where it will run from 4 June – 1 August. Make sure you don’t miss this if you are in either area at the time. AFG Pink Floyd Library Now Open There are probably close on 100 books that have been published in the English language alone about Pink Floyd. Many of them are dismal, but there are also some really great ones if you know what you are looking for. To help you find your way through the maze of books, we have introduced the AFG Library as to what we consider to be the best Pink Floyd books that are on the market today. Each book has been given a rating and either a review, or details about what you can expect. Annual Cinema For Peace Gala Report Earlier reports incorrectly stated that Roger was going to perform at the Eighth Annual Cinema For Peace Awards in Berlin on Monday (9 Feb). Roger was actually there to receive an award (see pics) but there was no performance from Roger! Surprise Appearance By David Gilmour Patrons at Ronnie Scott’s club in London on Tuesday (10th Feb) who went to see Phil Manzanera’s band were treated to a surprise appearance in the second set. David Gilmour joined long time friend Phil and the band onstage and helped perform ‘Autumn Leaves’ a bluesy rendition of ‘Petite Fleur’ and ‘Filles de Kilimanjaro’. In other news, sadly David missed on on getting a Grammy last Sunday (8th February) with the award going to Zappa Plays Zappa for their version of Peaches En Regalia. The Wall On Broadway News Author Lee Hall, best known as the author, on screen and stage, of the award-laden Billy Elliot, has confirmed he has been working on a ‘stage version’ of The Wall. News of this project has been scarce for some time, so it’s refreshing to know that progress on the stage version seems to be moving along. Pink Floyd Cocktail Our good friend Alex from Moscow was recently at the Bacardi Company offices and found the above when flicking through the corporate Bacardi & Martini magazine. 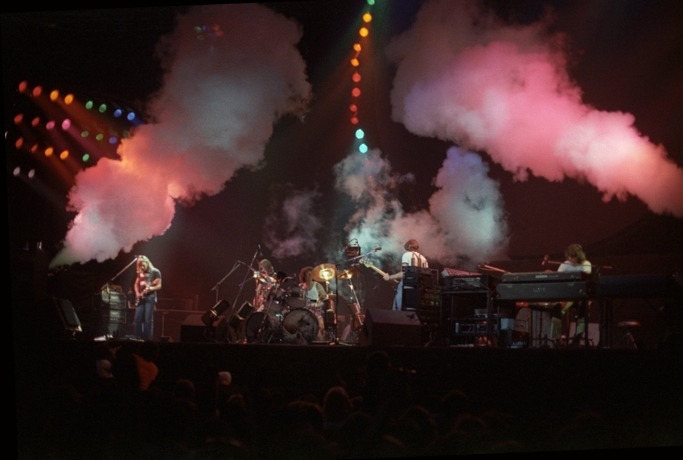 Unseen Animals Tour Pics Uncovered A whole bunch of unseen (as far as we are aware) pictures from Pink Floyd’s Animals Tour of 1977 have just been made available, and we are delighted to be able to bring you a great selection of them. Shot at the Festhalle – Frankfurt Germany in January 1977, these pics are of a high quality for their age. In addition we have been able to locate the Melody Maker article about the concert, which is an entertaining read in itself! SHOW ME NOW!